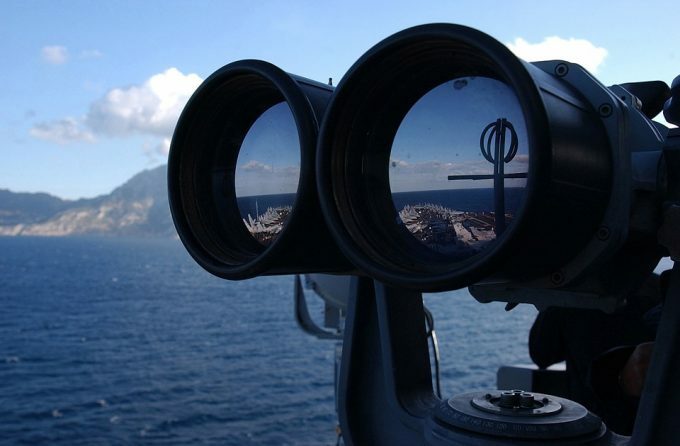 Binoculars are a great way to see what is to far to see with the naked eye. They are light enough that you can take them on nearly any adventure that you head out on, yet powerful enough to see miles away. Their one main downside is that it is kind of hard to share the view with anyone else. While you can pass the binoculars around the other person might now be able to see exactly what you where looking at. With the march of technology all sorts of functions are being blended together. Just as our telephones now sport fairly high quality cameras, the digital camera can be added to nearly any device out there. 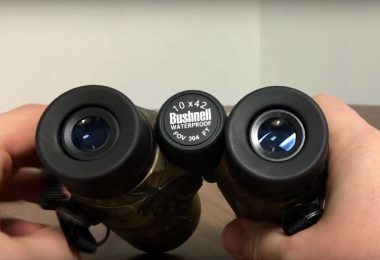 Today you can purchase a pair of binoculars with a camera built right in. Now you can freeze that moment that you see an animal or capture a video of what you are seeing. With this technology you can now share the exact view with not only others that are out with you, but even people that didn’t go on the trip. 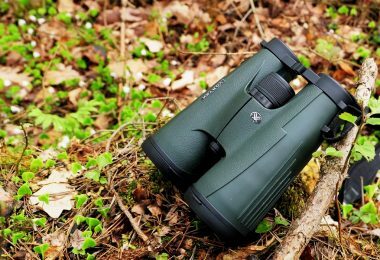 In the article below we will go through our picks for some of the best pairings of cameras and binoculars. But since you don’t want to just go out and grab the first reasonably priced pair that you find, we’ll go over some of the top features that you should keep on your mind when looking into selecting the best pair for you. We’ll start off with a table of our picks and some of their specs. If you are considering buying a high quality binocular with a built-in camera, you will find they have high zoom capabilities, have the ability to capture images clear, and give you tons of storage space. First and foremost you want a good pair of binoculars. 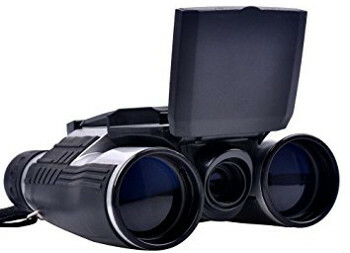 On each of the sets that you look through ask yourself if you would be happy with these binoculars without the camera. If the binoculars themselves don’t cover your needs, merely adding a camera won’t fill your needs. The size of the binocular from the magnification to the lens diameter is important to have in your mind. First, this will dictate how easy they are for you to carry about and use while you are in the field. Secondly, the magnification will let you know how far out you will be reaching to be able to see anything. These two will most likely form a balancing act, as higher magnification often means more size and weight to deal with. This is the measurement you can see while looking through your binocular. When you look through you will see a small chunk of the world. 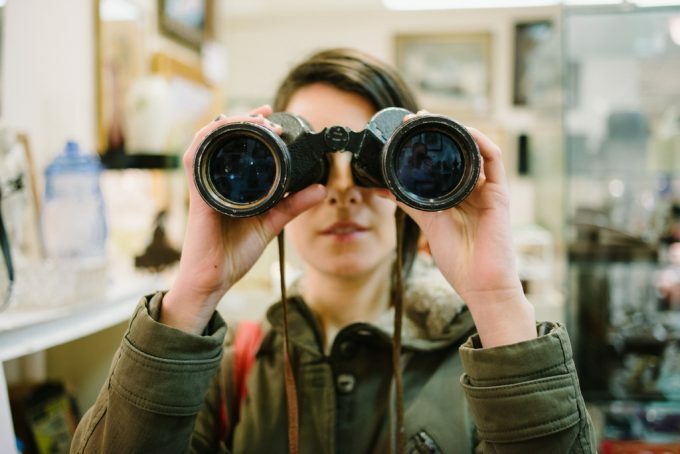 You will find that the greater the magnification is, the smaller your field of view will be. You need to balance getting a really close-up view of a small area with the ability to scan through a larger one. 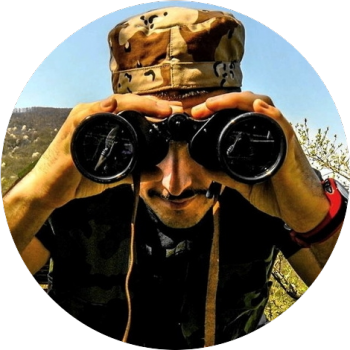 If you are going to be tracking fast moving targets you might want to go with less magnification to offer a wider field of view. The megapixel count is important as it is the resolution of the camera technology in the binocular. For a general rule of thumb, more megapixels will mean more data captured and this can often lead to a much clearer picture. While this isn’t always the case, you’ll find that it is a good jumping off point if you have no other photographic background to fall back on. The cost is another vital piece of information as this determines if the binocular with digital camera fits in with your budget. For many things the more you can spend the better of a product you have the ability to get. That doesn’t always hold that a more expensive model is going to be better. It is always a good plan to determine how much you can comfortably spend on this purchase and find the best option that fits into that range. Whether you are a birdwatcher, astronomer or out hunting the help of the best digital camera binocular open many doors when it comes to viewing images from afar. 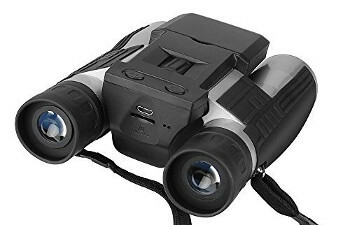 Once you have decided to buy a pair of binoculars with a built-in camera pay special attention to the added features from night vision, waterproof, shockproof, and other characteristics before making your choice. The FHD Digital Camera Binocular is a versatile model you can use for different purposes hunting, bird watching and more. 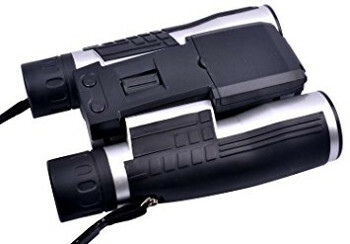 What makes this binocular with camera perfect is the nonskid rubber design to keep your hand in contact with the device in any weather condition. This is superb as you can adjust the width for different objects and get a quick focus without the binoculars falling out of your hands. With the digital camera design, you can control different functions with the 2-inch LCD display to take a perfect picture or video. Take as many photos or videos as you like as the device has a micro SD card slot with a capacity up to 32GB. Transmit the images with the USB cable to your PC. With the 12x32mm magnification and aperture, you can view objects from afar and it has a long-lasting built-in Li-Ion battery. With the telescopic 1080p display, you can view objects as it starts to get dark, but you cannot view anything when it is completely dark. Included with your purchase you receive the FHD binocular with the camera, USB cable, user manual and a strap. Related: If you plan to take loads of videos and photos, we recommend you buy yourself a type 4 or above Micro Sd Card to help save space. The Cocare D008 Binoculars has a 12x32mm magnification and aperture for you to bring objects closer and capture images simultaneously. 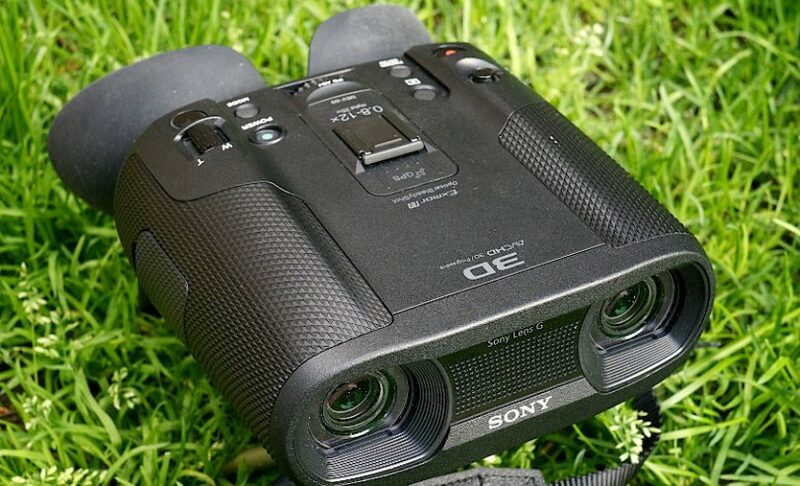 With the compact design, you have a combination of binoculars with a digital camera that has a two-inch LDC display. You can use the D008 for capturing clear photos in a dark environment and with the rubber structure achieve a quick focus without it dropping. Get 96m of vision at 1,000 meters you can enjoy a minimum focus distance of 8m. The photo format is JPEG and it uses a CMOS image sensor to take amazing pictures. With the AVI video format, you can take videos for hours with the built-in LI-ion battery and save it to a 32G micro SD card. Use it with Microsoft Windows2000/XP/Vista X86 systems to transfer the images for viewing at a later stage. Further, the device has a hard disc space above 1G. This model does not have night vision but you can capture photos and images at dusk. Included with your D008 binoculars you receive a USB cable and the user manual. Related: While outdoors on your hunting trip and capturing images you want to prevent losing your data. This is where the Sandisk Ultra 32Gb Micro Sd Card is handy to have. 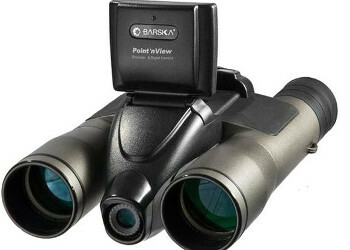 The Barska Point N’ View is a mid-size binocular with the camera making sure you never miss a shot ever again. 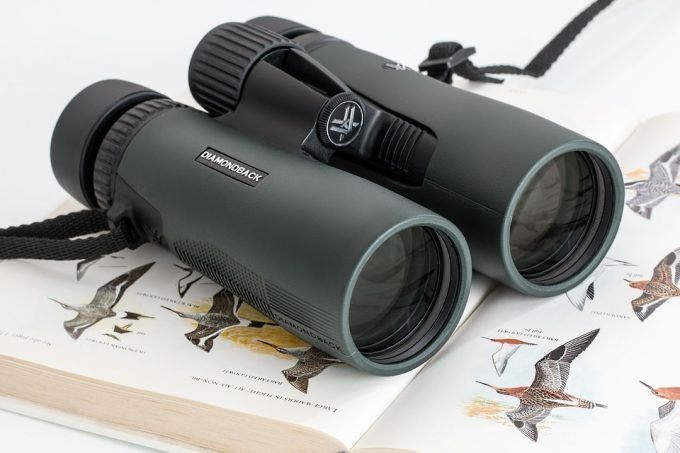 The point and view camera binocular has a roof prism design and gives you outstanding image clearness with the 32mm objective lens and has a 4mm exit pupil with optics that are multi-coated. Further, the camera has a 4 times digital zoom for easily capturing those far-away shots. Image’s optimized as the light changes with the automatic CMOS sensor. For ease of focusing, the device has a center focus dial and once you have, an object in view just snaps away. The digital camera has 8.0-megapixel resolutions and you can store your data on a micro SD card. The TFT screen’s color and has a review menu with menu/control panel for ease of accessing the digital functions. With the USB cable, you can transfer data to your computer to edit at a later stage. Included with your purchase you receive the Point and View binoculars, USB cable, photo editing software, a carry case, lens cloth and one-year warranty. Related: Keep your images stored on a Sandisk 8Gb Memory Card making sure that none of your photos are lost. 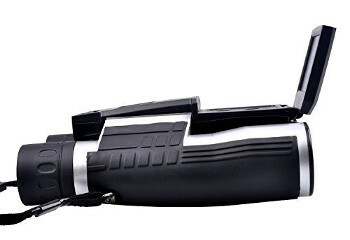 The Eoncore FS608 Digital Camera Binoculars Digital Camera Binoculars from Eoncore is binocular with a digital camera with different functions for viewing and capturing images. Capture high definition video with the LCD display giving you control for a perfect snap. 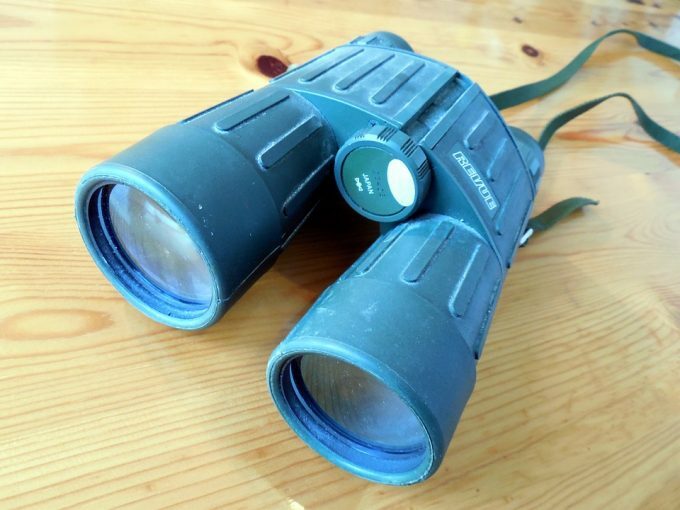 The pair of binoculars gives you a 96mm field of view with an optical zoom of 12X. The minimum focusing distance is 8 meters and has a JPEG photo format with AVI video format. Keep the device stabilized with the anti-shake feature and use the camera for single shots or times shots. The Eoncore has an ABS construction with CMOS image sensor. The camera has an optical and digital zoom of 4X with 5.0 megapixels with an image resolution of 5M, 1.3M, and 3M. The binocular supports a TF Card up to Class 4 with a maximum capacity of 32GB and does not have a built-in memory. The great thing is that the camera binocular has a built-in Li-Ion battery for hours of use. You receive included with the binocular digital camera a Micro USB charging cable, User manual, and cleaning cloth with a free 4GB TF card. Related: As you already receive the 4GB memory card with your binocular and camera why not adds a Sandisk Ultra 32Gb Micro SD Card to expand the memory as a 4GB card can fill up quickly. The Kingear FS608 Binoculars Camera is one of the best binoculars with digital camera technology at an affordable price. For quick control, access the LCD display to use different functions in capturing the best image and video. With the 12x32mm magnification and aperture, you can take a closer look at images and capture it at the same time. View and capture images in a dark environment and has a 5.5° angular field of view with an exit pupil diameter of 2.08mm. The minimum focusing distance is 4 meters and you can save images in JPEG/AVI file formats directly to your PC. The device has a designated micro SD card slot and can take a memory card up to 32GB. Further, it has a built-in lithium battery you can charge with the USB cable and supports tripod use. 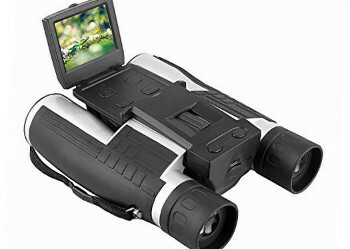 With your purchase, you receive the digital camera binocular, a USB charging cable, user manual and a one-year warranty. Related: While outdoors viewing nature in its entire splendor with your digital camera binoculars in hand you may need a bit of stabilizing. With the Amazon Basics Tripod, you can achieve this making sure you do not miss the perfect shot. With PowerLead FS608 Binoculars Camera, you can observe things closer with the 12X magnification and 32mm objective lens. The great thing is that you will not only be able to view your target you can capture every moment of it. The FS608 is a pair of binoculars with digital camera helping you to capture images to view later. View the images displayed on the LCD screen and access different functions to snap the best picture and video. The minimum focus is eight meters and the photo/video formatting is JPEG/AVI. Further, the units able to take a memory card up to 32GB. When you buy the PowerLead, you receive the digital camera binocular, USB cable, lens cloth, User Manual and a one-year warranty. Related: As the PowerLead is lightweight and has an anti-shaking function, you can still use the device with the following Tripod to give it a stable platform. 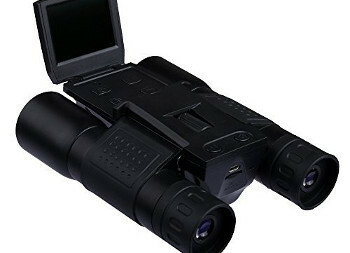 The Fitiger Binocular Digital Camera has the latest 2-inch TFT HD LCD Camcorder built-in. With the high-definition, the digital telescope takes amazing videos. With the 12x32mm resolution, you can bring any object closer to view and capture every moment of what you see. Further, you get a 96m visual field with a focus distance of 8m. The still image format is JPEG and has a TF storage expansion with a video resolution of 1080 FHD. The video frame rate is 30 fps and you can use a 32 GB memory card with it. 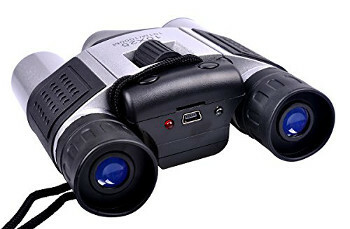 The binocular with a digital camera you can connect to your PC and uses two x AA batteries not included. This is a compact device measuring 193 x 141 x 77mm and weighs 610g. Included with your purchase you receive the binocular camera, cleaning cloth, USB cable, neck strap, and user manual. Related: To help expand the memory of the FITIGER you can look at the 32Gb Sandisk Micro Card to keep all your photo and video shots safe. With the Kingear KG0012 Binoculars Camera, you can capture the perfect photo while viewing it through the binoculars. You can even take photos and videos in a dark environment with the device. With the digital camera and binocular combination, you get a high definition camcorder to use while on the go. The LCD display gives you access to different functions to use while viewing objects making it able for you to record every moment of your adventure in high definition. Included with your device you receive a USB cable, lens cloth, and a user manual. Enjoy a close view of far objects with the 12 times magnification. Related: Prevent the video recording from becoming shaky when use at its highest magnification you can mount the binocular camera on a Tripod. Are you in need of a pair of binocular that have their own built-in camera? 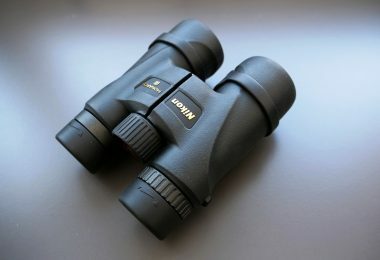 We are sure that the binocular with digital camera reviews available here will help you to find a suitable one. These top of line camera binoculars take high-quality photos and HD videos and versatile to use on any adventure you take. With the high magnification and optical lenses available on the above-mentioned brands, you can easily focus on a target and capture every moment while indoors and outdoors. We’d love to hear from you if you have experience with any of our selections. Let us know about it in the comments section below.